Planting corn isn’t as complicated as it seems, but it does take up some space. 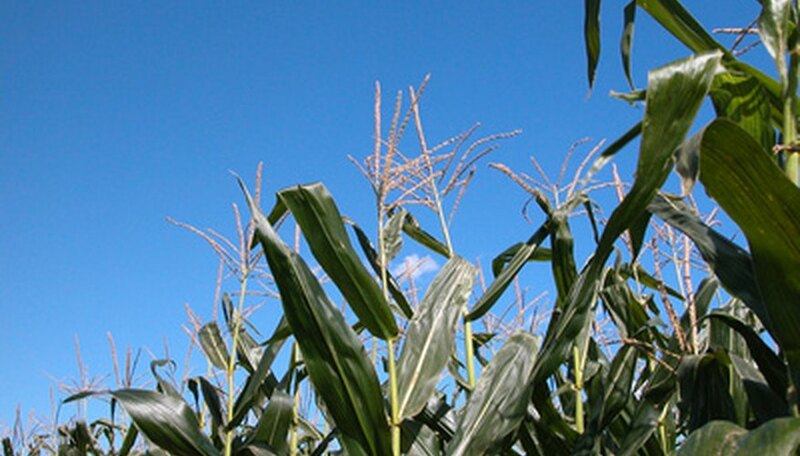 Corn needs to be planted in rows or preferably in blocks in order to cross-pollinate by wind. Corn comes in many different varieties, including sweet, yellow, white, bi-colored and even super-sweet types. You can grow corn in a home garden, raised bed or even large containers, just as long as the soil is fertile and nitrogen-rich. Because corn will grow only in warm temperatures, and the sweet corn varieties like even hotter conditions, you’ll need to wait to plant your corn until mid- to late spring in most regions. Choose a planting site for your corn that receives full, direct sunlight and has well-draining soil. If you’re planting the corn in your garden, plant it on the north side of the garden to avoid shading your other plants. Loosen the soil at the planting site to a depth of at least 1 foot using a rototiller or pitchfork. Spread a 2- to 4-inch-thick layer of organic compost or well-rotted aged manure on the soil bed and mix it into the soil. Plant the corn seeds in the spring when the soil warms to about 60 degrees Fahrenheit. Plant the corn seeds 1 ½ to 2 inches deep into the soil, spacing the seeds 6 to 8 inches apart in blocks of at least four rows spaced 2 to 4 feet apart. Thin out the weaker corn seedlings to space the plants about 12 to 16 inches apart. Thin the corn seedlings when they’ve reached about 4 or 5 inches in height. Hand-pull or shallowly hoe weeds until the corn seedlings are about 18 to 24 inches tall. Then, spread a 3- to 5-inch-thick layer of mulch around the corn plants to control weeds. You should water your corn deeply once each week when rainfall is less than 1 inch. Harvest the corn ears when they're filled out with kernels. Press your fingernail into a kernel to ensure that a milky-white liquid emerges. Beware of nitrogen deficiencies in your corn, because these vegetables are heavy feeders. If you see the leaves begin to turn yellow, spread a "side-dressing" of nitrogen fertilizer along the rows about 4 inches away from the corn stalk bases.